TeamStudy, an app that is part of the Football Players Health Study at Harvard University, uses ResearchKit to help former NFL players and the public better understand brain function, heart health, pain and mobility. 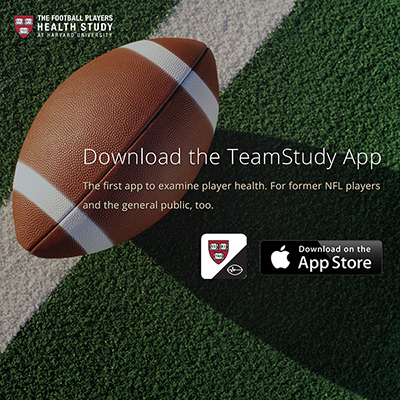 The Football Players Health Study at Harvard University—a series of studies that examine the health and wellbeing of former football players and aims to develop more effective diagnostic and therapeutic interventions—today launched TeamStudy, an iPhone research app built using ResearchKit, the open source software framework designed by Apple. “By bringing the Football Players Health study to this app, we’re able to easily capture data from participants all over the nation, enabling us to better understand the everyday experiences of former NFL players,” said Alvaro Pascual-Leone, the principal investigator of TeamStudy. Pascual-Leone is a professor of neurology at Harvard Medical School, chief for the Division of Cognitive Neurology at Beth Israel Deaconess Medical Center, and director of the Berenson-Allen Center for Noninvasive Brain Stimulation. “Assessing cardiovascular health is a key function of the app and a priority of the Football Players Health Study. We need to understand more about heart health among former athletes and work to identify factors that contribute both to health and disease,” said Aaron Baggish, associate director of Massachusetts General Hospital’s Cardiovascular Performance Program and co-medical director of the Boston Marathon.